These little Crisps are quick to go together and bake in just 30 minutes. Perfect to have in the oven while you eat a leisurely dinner. Serve with a scoop of vanilla ice cream or yogurt if you like. I use small baking dishes that are about 4" (10cm) in diameter. Granny Smith, Golden Delicious, Pink Lady are all good apple choices. Butter individual baking dishes or one small baking dish. 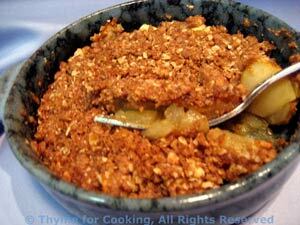 Sprinkle crumble mixture over apples. 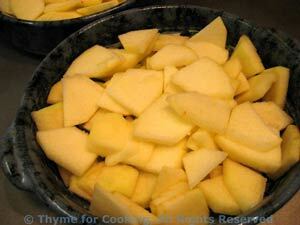 Bake 30 minutes at 375F (185C), until top is brown and apples are tender. Note: If you use individual baking dishes, put them on a baking sheet to make handling easier.